It has been a great demonstration of force from Ferrari and Sebastian Vettel, the one shown on the track of Melbourne on Sunday. For the first time in the era of hybrid engines (2014, 2015 and 2016 seasons) Mercedes have been defeated on track. 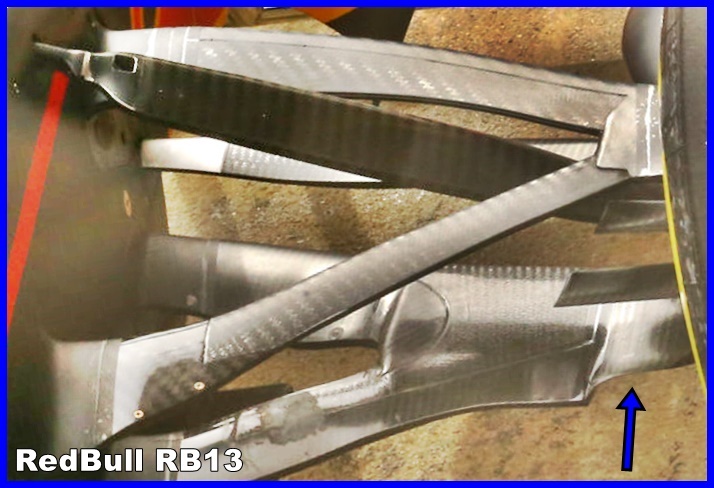 The other wins from RedBull (2014, 2016) and Ferrari (2015) has been obtained mainly thanks to some errors or issues occurred to the German team. The one of yesterday, instead, has been the win of the fastest car on track that exploited and managed in the best way possible the new tyres developed by Pirelli. 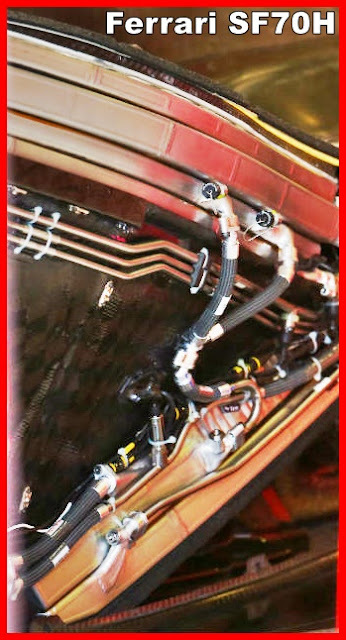 The rumors that wanted an uncompetitive Ferrari were, as a consequence, not entirely true (not the ones related to the presence in the wind gallery of a SF70H-B with a longer wheelbase, though, still on study to evaluate the pros and cons of such a solution) with a team that probably wished to work with low pressure and few expectations from mass media and fans. News that were reported on this website but also on other more prestigious and well-known headlines. 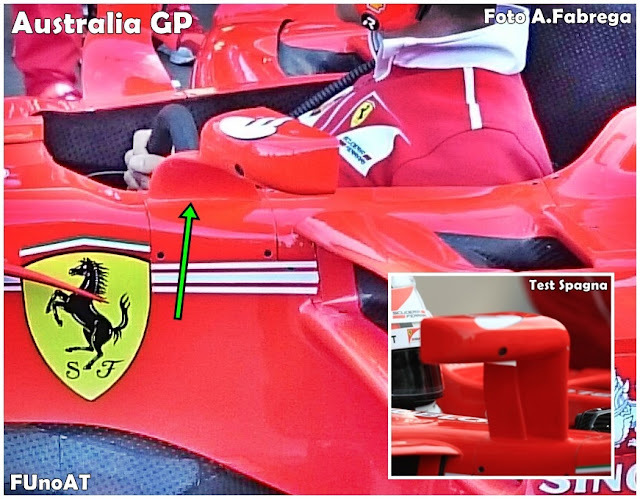 Few people trusted the horizontal structure adopted by Marchionne and Binotto. The new arrivals (no big names), in the engine department mostly from Mercedes and in the aerodynamics department from RedBull, seem however to bear fruit. After this necessary premise, let’s go more in depth and see the analysis of the race. Starting from this season, we will try to analyze it through the use of words and graphs. Since the earliest laps it was clear that the fastest car was the one of Sebastian Vettel. After a pretty good start, he managed to keep the position against Bottas and Raikkonen. In the latest years we were used to see one of the two Mercedes’ drivers opening a substantial gap in the earliest laps while easily managing the race and, with no pressures, the strategy. To be honest, even in this case we could expect a race of this kind, given the very good pace exhibited by Mercedes on Friday’s free practices. 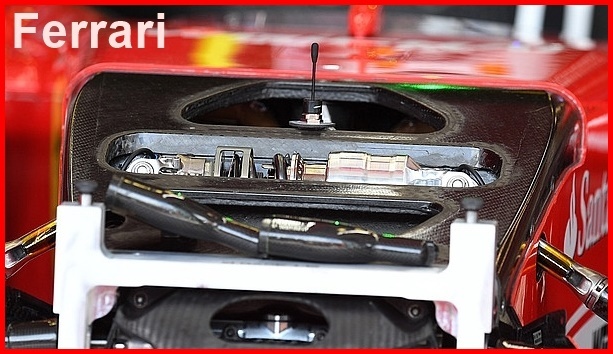 But it has not been so thanks to the amazing work of the Ferrari’s team after Friday’s FP2. On Friday, both cars seemed to miss a little bit even if they did not appear too unbalanced, that bit that was found on Friday night. However, by looking at the performance of Vettel and Raikkonen throughout the weekend, it is worth noting that what said above fits more to the German driver. 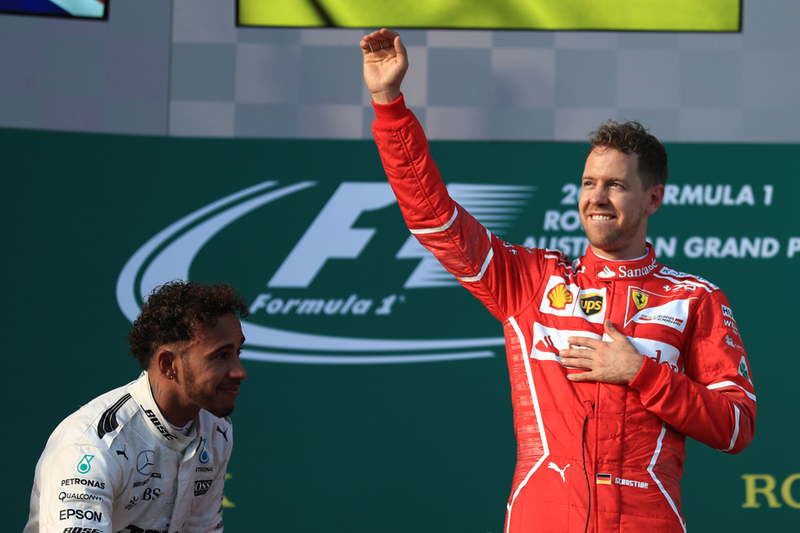 Vettel has been able, since the start of the race, to put under pressure Lewis Hamilton, making him realize that if he wanted to win he should have toil for it. He managed to stay very close to the W08 of the triple world champion for some laps, and this gives proves that the Man in Red was quicker. Realizing that the overtake on Hamilton was nearly impossible, he slowed down a bit and took some space, both to ensure a correct cooling of the car, and to manage the use of tyres without losing ground to aim at an easy undercut already planned. Exactly in the management of tyres, the Achilles’ heel of the latest seasons, Ferrari built this very important win. 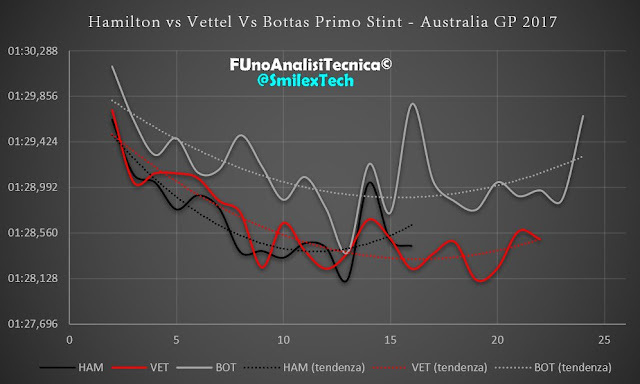 Looking at the tendency line at the beginning of the race, it is possible to note how the pace of Vettel has been the best, both in chronometric terms and in terms of the decline of tyres. Only Bottas, of the first three drivers, exhibited a similar tendency line making though record slower lap times of about 0.5 seconds (as you can see in the 1st graph). TEAM MERCEDES: according to Plan A, Hamilton’s pit stop should have occurred one lap later, during the 18th lap. Let’s focus on the moment that decided the race, the anticipated pit stop of Lewis Hamilton. The moment chosen by the German team seemed to nearly everybody a bit ahead of time, even if it is worth noting that the Soft compound would have been able to resist to all those laps by ensuring a decent pace. The biggest trouble occurred to the English driver was to find himself behind Max Verstappen, not the simplest driver on the grid to pass, showing that the choice of the engineers has been a mere gamble. To be precise, after the race, we came to know that the pit stop of Lewis Hamilton was planned at the 18th lap, one lap after. The question then is: why did Mercedes decide to stop a lap earlier, without apparently considering that their driver would have found himself stuck in the traffic of the RedBull? 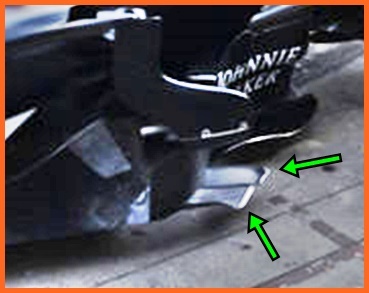 Analyzing the first 16 laps of the driver number 44 (graph 2) it is possible to note that the tendency line started to nose up, symptom of a considerable decline of tyres. Since the beginning of the race he repeatedly whined with his engineer about the lack of grip, caused probably by an unusual oversteer felt on the W08 throughout the weekend, which elicited an anomalous overheating of tyres. However, there was not such an important deterioration to force him to an early pit stop (even if in the last lap of his 1st stint he lost more or less 7 tenths in only two sectors). This fact had put on alarm the box, who opted for an early call. 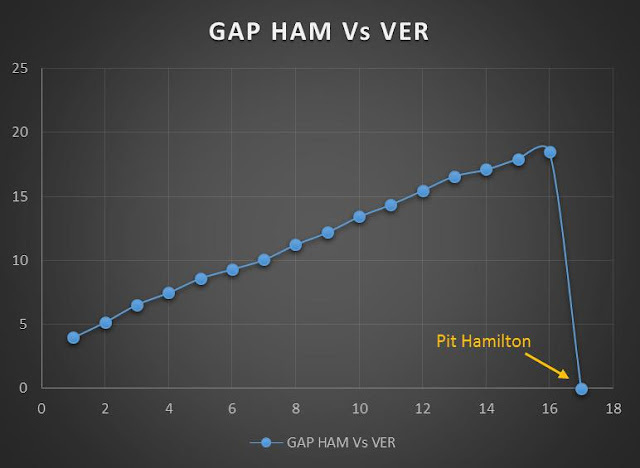 Looking at the graphs below, we see that Hamilton was progressively opening the gap on Verstappen. Until the 13th lap he was gaining about 1 second per lap, while from the 14th to the 16th lap the gain reduced to 6 tenths per lap on average. At the 16th lap the gap between the two drivers was of 18.5 and, looking at the tendency, Hamilton should have pitted at least 6 laps later in order to maintain the position on the Dutch driver (he would have anyway risked because few seconds ahead there was the SF70H of Kimi Raikkonen). Mercedes, put under pressure, has hurried the stop and Ferrari has cunningly took advantage from it. The pressure that Vettel was exercising on Hamilton, turned out to be crucial to cause big issues to the brains of the German team. The traffic caused by Max Verstappen has been fundamental to make the strategy of Ferrari effective. As you can see from the graph below, Hamilton, in the first two laps after the pit stop, has been able to gain some tenth on Sebastian. From lap 20, however, the English driver started to lose ground due to the presence of the RedBull RB13. 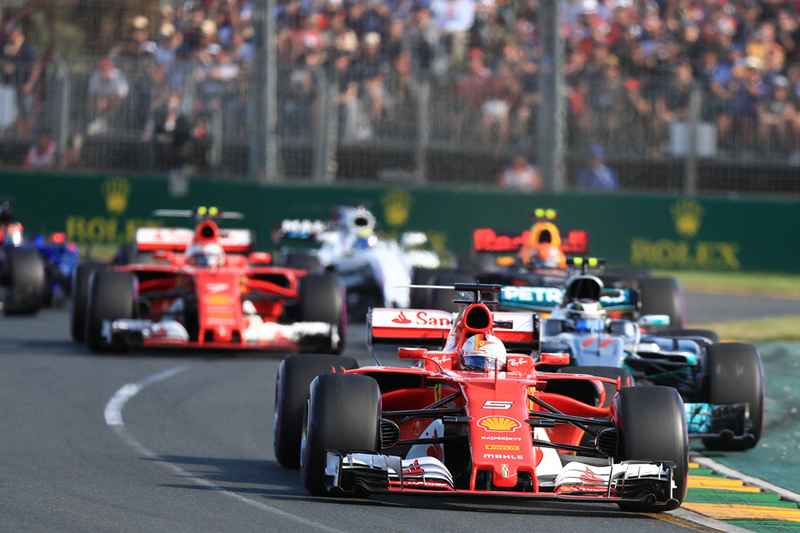 The 22th lap revealed to be decisive for the destiny of the race, with Sebastian Vettel gaining 1.4 seconds on the triple world champion and building the gap needed to pit during the following lap. Perfect strategy from the Italian team. For what concerns Mercedes, instead, we reached the conclusion that their decision cannot be completely considered a mistake for the reasons explained above (decline, chance to undercut Vettel,...). Could they force Vettel to undercut on Hamilton and get him stuck in the traffic? Yes, if the tyres of Lewis were in good conditions. In the table below we summarized the average times set by the top 5 drivers in the first part of the race: all the drivers involved were on UltraSofts (tyres already used in the Q2 of Saturday’s Quali). 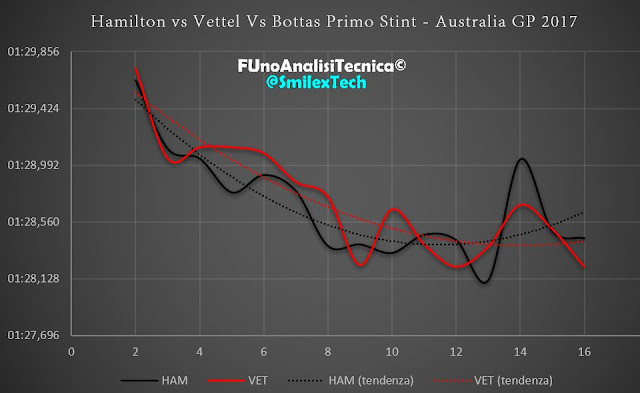 From this analysis it is possible to note that the pace of Vettel was slightly better than the one of Hamilton (who, however, had a 25% shorter stint) by few thousandths. Not good, if compared with the one of Hamilton, the pace of Bottas who has been 6 tenths slower than his teammate (on same tyres). Same for Raikkonen who appeared in trouble over the whole weekend. Difficulties highlighted also in the pace during the 1st stint, given that the gap from Vettel was of 7 tenths. During the 2nd stint the fastest car on track was the RB13 of Max Verstappen. The Dutch driver has been capable of exploiting at their best the SuperSofts without major problems realizing a stint of 32 laps. 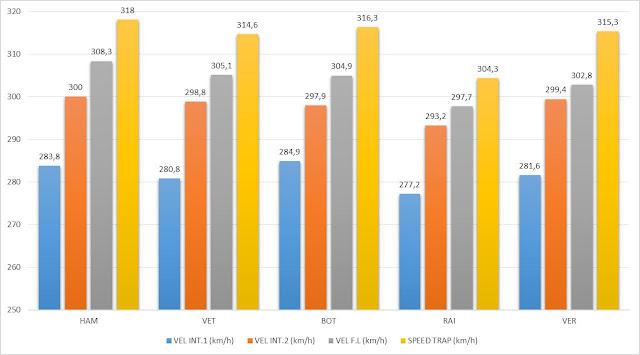 Among the drivers who used the Soft tyres, the pace of Sebastian Vettel has been very similar to the one of Valtteri Bottas, and to the one of Max Verstappen (on SuperSofts, as indicated above). It is important to remind that the difference of performance between the two compounds was more or less of 7 tenths per lap, reduced over the laps due to a greater decline of the red compound. Pretty good also the pace of Kimi Raikkonen who, using this type of tyres, nearly matched his teammate. 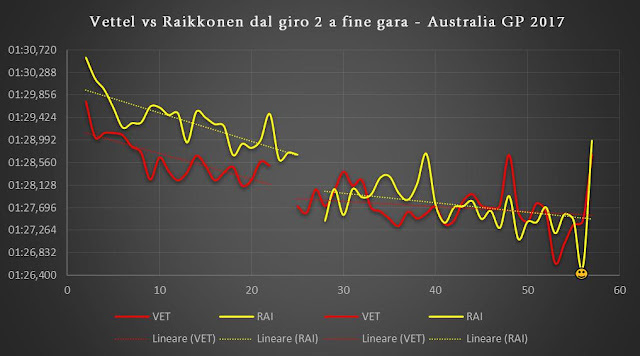 The graph below shows that Raikkonen, during the 56th lap, set the fastest lap of the race. Anyway Vettel, given the gap on Hamilton, did not push hard in the last part of the race but he only focused on managing the car and the tyres (he, however, set the 3rd fastest lap). Insufficient performance the one of Hamilton on Soft tyres: he had never found a decent pace (even worse than Bottas). 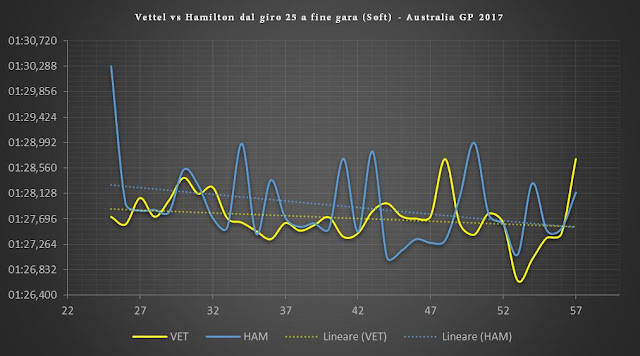 Looking at the graph below it is possible to see the fluctuating tendency of his times (lapped drivers should be not be blamed for this, given that the same cars were easily passed by Sebastian Vettel). It seems that the main issue of the Mercedes W08 of the English driver has been the overheating of rear tyres. After two or three fast laps, the triple world champion, was forced to “take a break” in order to bring his tyres back to their window of functioning. Analyzing top speeds, we see a Ferrari in a very good shape, exhibiting speeds similar to those of Mercedes. This, once again, proves the amazing job of the team directed by Sassi, who developed a Power Unit at the level of Mercedes. The SF70H in this race, combined a very aggressive rake setup, a high downforce rear wing and the monkey seat. Mercedes, instead, opted for a medium downforce wing coupled with a smooth setup. Notwithstanding this, the speeds recorded by the SF70H has been really good. 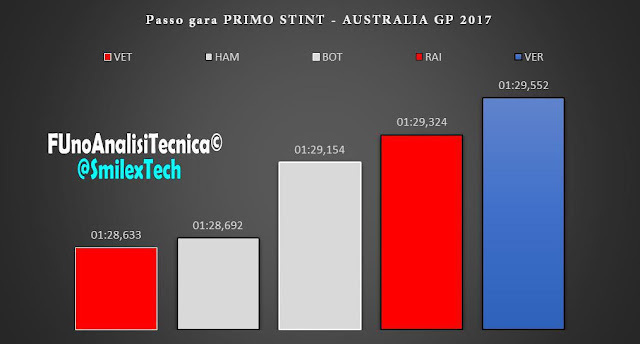 Ne avevamo già parlato durante il fine settimana del Gran Premio d'Australia ma siccome non si era terminata l'analisi del pacchetto di aggiornamenti portato in pista dalla Mclaren a Melbourne è bene ora tornarci. Un pacchetto di aggiornamenti completo utilizzato solamente da Fernando Alonso e che ha garantito al pilota spagnolo circa 4 decimi al giro sulla buona pista australiana. La prima novità, già analizzata durante il weekend australiano, riguarda la parte alta delle pance dove i generatori di vortici sono diventati tre contro il singolo della vecchia specifica come mostrato nella foto confronto appena sotto. 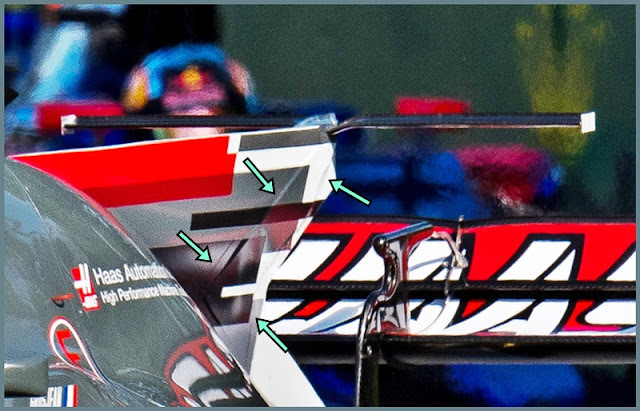 Importanti modifiche anche nella parte alta e bassa dei bargeboard. Il Team di Woking ha reso più complesso il deviatore di flusso collegato al telaio della MCL32 che ha il compito di accentuare l'effetto "downwash" per portare un flusso molto energetico nella zona esterna del diffusore, aumentando cosi l'efficienza dell'elemento stesso. 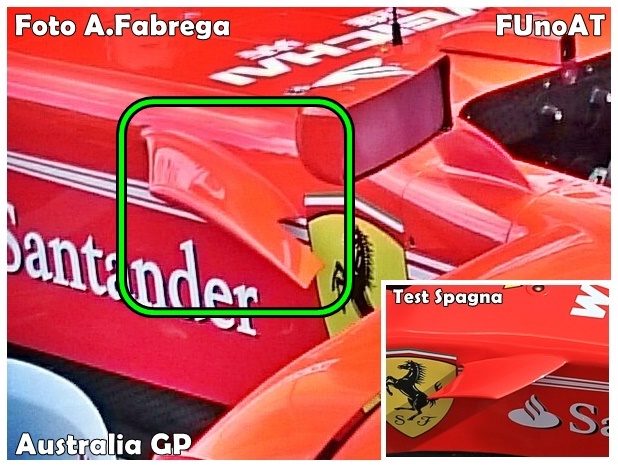 La seconda modifica sempre nella zona dei bargeboard è l'introduzione di una ulteriore appendice nella zona anteriore ai deviatori di flusso laterali alle pance composta da due profili. Le novità che ancora mancavano da analizzare riguardano in primis l'ala anteriore che non è stata stravolta anche se presenta delle modifiche piuttosto importanti. Come potete notare dall'immagine qui sotto, la soffiatura sul mainplane è stata prolungata (frecce rosse), sono stati ridisegnati tutti i flap superiori che ora risultano avere una superficie frontale maggiore (rettangolo verde) e per ultimo è stata leggermente modificata la parte inferiore esterna degli endplate (freccia gialla) con un profilo che ha una curvatura più accentuata. 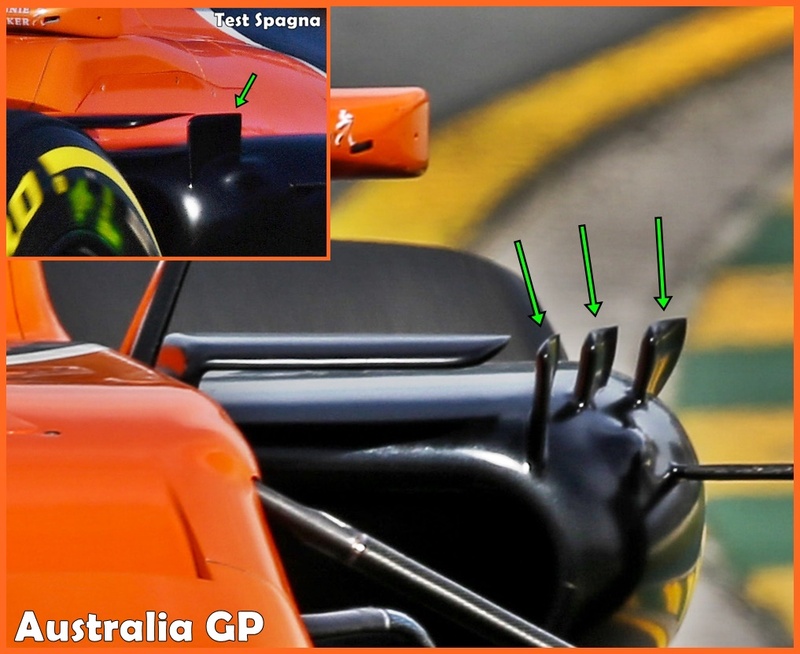 Ultima modificata notata sulla tanto deludente MCL32 vista in Australia è relativa alla zona del fondo davanti alle ruote posteriori, parte dove il Team Mclaren si differenzia molto dalle altre scuderie. Come si può ben vedere dall'immagine in basso il Team di Woking ha inserito un piccolo profilo verticale di contenimento del flusso d'aria che scorre al di sopra del fondo. 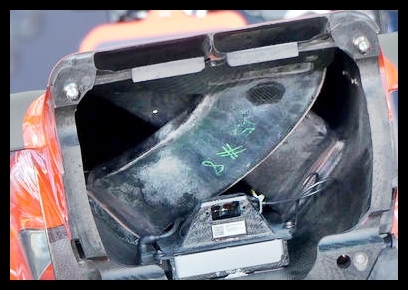 E' interessante vedere come Mclaren controlli in modo molto differente rispetto agli altri Team quell'effetto chiamato "tyre squirt", ossia quel flusso molto dannoso che chiamiamo “tyre squirt”; un flusso molto energetico che si crea grazie al rotolamento (in senso contrario all'avanzamento della vettura) dello pneumatico posteriore. 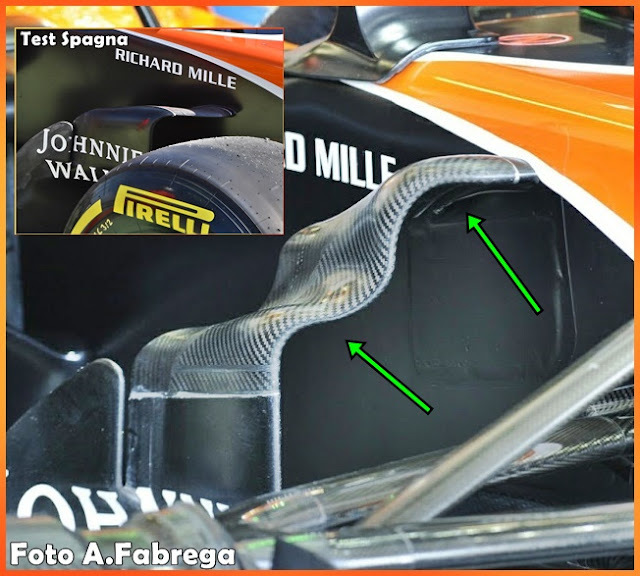 Se gli altri Team hanno optato per delle soffiature sul fondo, Mclaren ha inserito fin dalla presentazione della vettura un piccolo profilo a "ricciolo" che tende a minimizzare l'importanza della turbolenza nella zona esterna del diffusore, parte molto critica in una vettura di Formula 1. Dopo un inverno pieno di colpi di scena, pronostici più o meno azzeccati e tanta ma tanta attesa, i motori del Circo targato Liberty Media si sono accesi (per la McLaren Honda questa è già un buon punto di partenza), e non per dei test su cui anche quelli che confondono il calcio con la F1 speculano e danno il proprio parere, ma per una gara vera e propria, dove non ci sono più carichi di carburante diversi o team che giocano a nascondino. Sì proprio così, perché l'altro ieri è andato in scena il primo capitolo su venti di un libro che speriamo essere più appassionante dei passati, dove non si scherzava più, dove in palio c’erano i venticinque punti e non la soddisfazione di una giornata di test passata in testa. Finalmente abbiamo potuto capire i veri o quasi valori di campo. Perché quasi? Semplice. Perché io preferirei aspettare qualche gara in più prima di dare sentenze definitive. Melbourne molto spesso mostra i potenziali valori in campo e proprio perché “potenziali” c’è la possibilità che durante la stagione cambino o addirittura vengano stravolti. Sappiamo quanto importante sia lo sviluppo nell'arco delle venti gare e quest’anno con il cambio regolamentare diventa fondamentale perché i team al momento si ritrovano ancora monoposto “grezzo”, da “affinare” per rendere al meglio. La gara tra i canguri ha confermato che la Ferrari ha fatto un salto di qualità pazzesco rispetto all'anno precedente ed ora è lì, vicina più che mai alla Mercedes. Alcuni di voi dopo la gara hanno considerato la Ferrari come la prima forza del mondiale, ma io ci andrei con i piedi di piombo, io eviterei di fidarmi della stella a tre punte. Secondo il mio parere la Mercedes è ancora avanti (lo hanno dimostrato le qualifiche) ma se la Ferrari da anni ha provato invano a fare il colpaccio, questo potrebbe essere l’anno giusto. 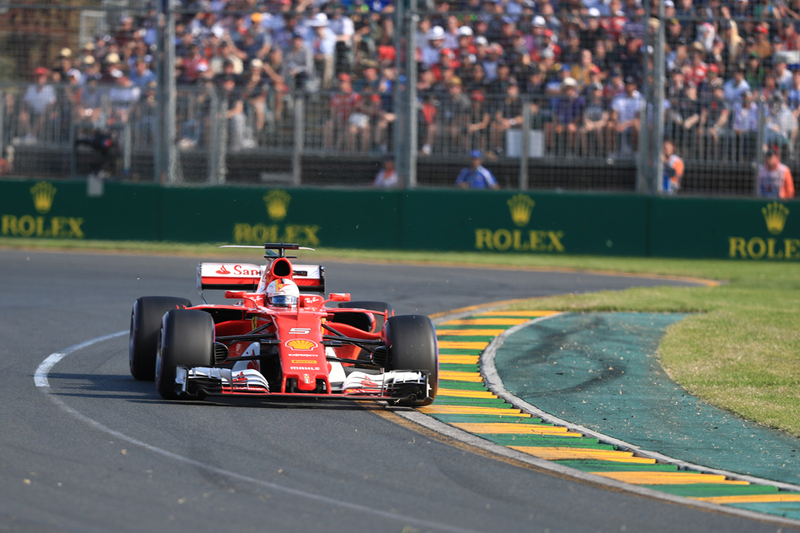 La vittoria di Vettel a Melbourne è stata diversa dalle altre con la Ferrari, si sente che qualcosa sta cambiando. Dopo queste personali riflessioni, provo a dare qualche voto ai protagonisti del Gran Premio D’Australia. Avete qualcosa da ridire? Finalmente abbiamo rivisto il Sebastiano dei tempi migliori, quello dei quattro titoli mondiali in Red Bull e quello del primo anno in Ferrari. Pur facendo qualche sbavatura in qualifica mette in seconda posizione la sua Gina e in gara dimostra di essere superiore alla Mercedes di Hamilton fin dal primo giorno. 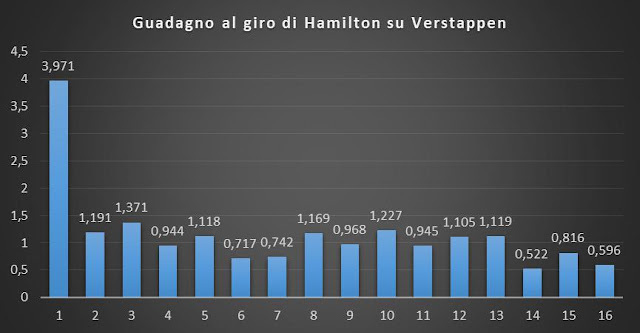 Quando, dopo il pit, ha strada libera distanzia Hamilton di ben 7 secondi, a dimostrazione del grande passo del quattro volte campione del mondo. E poi sentire di nuovo l’accoppiata inno tedesco-inno italiano è pura goduria e riporta la mente a quella leggenda che sta lottando tra la vita e la morte. Luigino il suo lo ha fatto. Pole il sabato (62 pole in carriera, a tre lunghezza da Senna), partenza perfetta la domenica. Da lì tutto si è complicato per demeriti di una Mercedes che non fa funzionare a dovere le Ultrasoft e per meriti di una SF70H praticamente perfetta con Vettel. Da annotare anche la strategia suicida della Mercedes, che dopo aver pittato lo mette dietro ad un certo Verstappen con gomme in fin di vita. Ma non mi sento di accusare il team, la Ferrari è stata superiore. 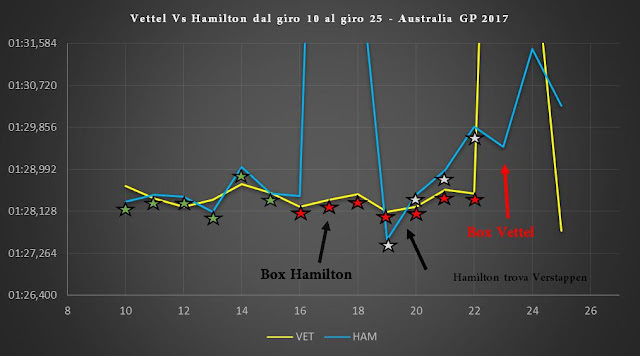 Se è questo il Valtteri che vedremo durante la stagione, Hamilton potrà fare tutti i festini che vuole perché lo batterà a mani basse. 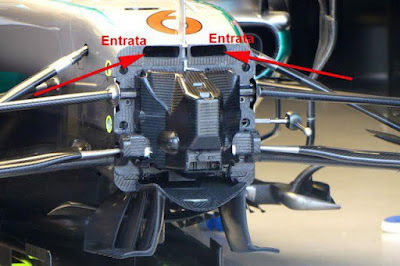 In qualifica si è fatto sfuggire una seconda fila che dal 2014 è proprietà Mercedes e in gara non ha brillato più di tanto, limitandosi a fare il suo compitino. Tutto il weekend in difficoltà, l’aria australiana quest’anno non ha fatto per niente bene ad Iceman. Prendere 6 decimi e 22 secondi rispettivamente in qualifica e in gara dal compagno di squadra non è un bel biglietto da visita per la stagione che verrà. Prestazione deludente da parte del bambino prodigio. Sicuro che sia tutta colpa sua? Zitto zitto il trentacinquenne brasiliano con la sesta posizione finale è il primo degli “altri”. Se continua così, ha fatto bene a non appendere il casco al chiodo. Sainz e Kvyat entrambi a punti già alla prima gara e ogni anno sembrano alzare sempre di più l’asticella. Si lavora proprio bene a Faenza. Svegliarsi il sabato e scoprire di dover debuttare in F1 è fantastico per certi versi, orribile per altri. Il sangue freddo e il talento gli hanno permesso di finire in qualifica solo a pochi centesimi dietro al più esperto compagno di squadra e portare la Sauber al traguardo al 12esimo posto. Può fare molto meglio di così ma tranquillo Giovi, il tempo c’è; intanto per me sei stato un altro motivo per essere fiero di essere italiano. Vederlo per l’ennesimo anno in queste situazioni non fa bene alla Formula 1. Scherzi a parte, Danielino avrà fatto più km a piedi che in macchina. Weekend da dimenticare. In silenzio per tutto l’inverno, nessuno proclamo, nessuna dichiarazione. La lezione dello scorso anno è servita. Ed è servito anche questo silenzio, perché i risultati in pista fin adesso danno ragione al team di Maranello: hanno recuperato il gap dalla Mercedes e ha messo in pista una monoposto prestazionale, gentile con le gomme e, vedendo i risultati dei test, anche molto affidabile. A noi la Ferrari piace così: meno chiacchiere, più fatti. 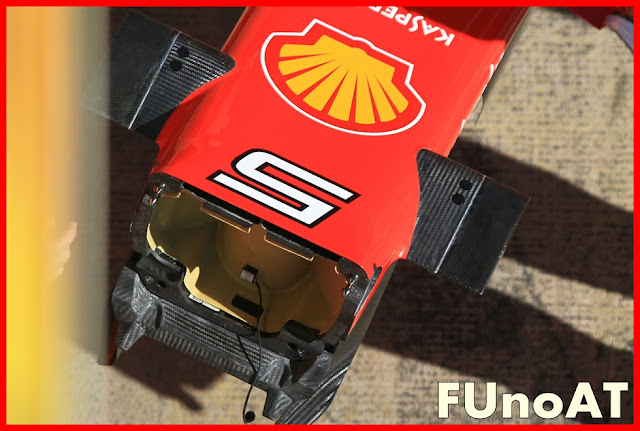 Se saprà sviluppare al meglio la SF70H durante l’anno, quel 10- si trasformerà in un bel 10. Al terzo anno in Formula 1, il colosso giapponese non riesce a trovare la quadra su questi “nuovi” motori ibridi. I tempi di Senna e Prost sono finiti da un bel po’, è ora di fare un mea culpa e rimboccarsi le maniche. La McLaren merita di più. Durante l’inverno passato vi abbiamo parlato molto della Ferrari 2017, partendo dal muso a protuberanza con S Duct (non stile Mercedes....), arrivando fino alla parte posteriore con la presenza della pinna stabilizzatrice e della non separazione del turbocompressore nella Power Unit Spec 2017 del Team italiano. 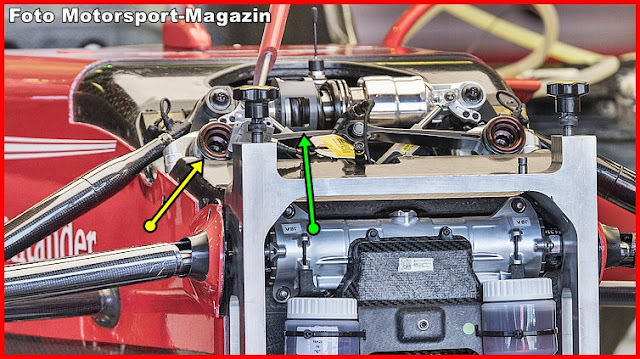 L'informazione che non era circolata, riguardante un'altra parte sempre molto interessante della F1 moderne, è quella relativa ai radiatori della Ferrari SF70H. Durante la gara inaugurale di questa stagione 2017 di Formula 1, vinta proprio dalla vettura italiana guidata da un fantastico Sebastian Vettel che ci ha messo tanto del suo per portare la rossa alla vittoria, è stato possibile notare come anche sulla Ferrari 2017 i radiatori all'interno delle pance siano posizionati a V, una soluzione portata in pista, per chi non se lo ricordasse, anche lo scorso anno dal Team italiano. Per gli appassionati di Formula 1 più "datati", la soluzione sopra mostrata e utilizzata anche dal Team Haas nel 2016, non è una novità; già nel 2005 infatti la scuderia di Maranello utilizzò una soluzione simile sulla poco fortunata F2005 portata in pista all'epoca da Schumacher e Barrichello. Tale soluzione ha permesso alla scuderia italiana di mantenere anche quest'anno un posteriore molto rastremato, garantendo cosi una maggior portata d’aria soprattutto nella zona superiore e centrale del fondo, fondamentale per la generazione di carico aerodinamico grazie al diffusore. 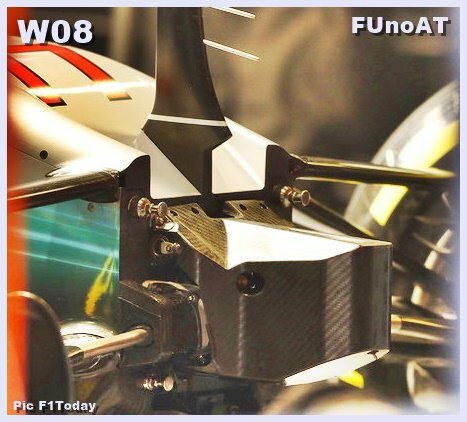 Invece non si può dire la stessa cosa per il Team Haas, che per motivi principalmente di affidabilità ha mantenuto una rastremazione al posteriore più generosa e meno spinta. Vittoria Ferrari. Voto: 10 e lode. E così, comincia questo nuovo mondiale con un gran premio vinto di forza dalla Ferrari nella terra dei canguri. Lo scetticismo di tanti, fra i quali chi scrive, è stato spazzato via da una vittoria esemplare. Tanto di cappello. Struttura orizzontale. Voto: 10 e lode. Avevo ironizzato pesantemente (e giornalisti e tecnici ben più titolati del sottoscritto avevano fatto lo stesso), con motivi più che fondati, su questa struttura orizzontale e sull’idea della promozione delle seconde linee a prime linee. Mi sembrava una scelta dettata dalla disperazione, dopo l’addio di Allison, e dopo il diniego più o meno garbato di altri tecnici contattati. Bè, confermo che “struttura orizzontale” suona davvero male. 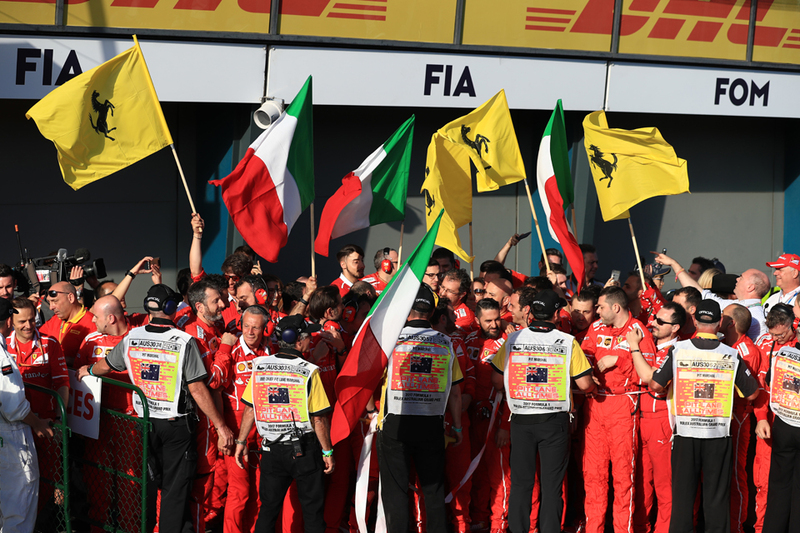 Però...facciamo così...qualsiasi cosa sia l’attuale organigramma Ferrari, per ora funziona egregiamente. Mi cospargo il capo di cenere. E lo faccio con piacere, visto che raramente la Ferrari è stata composta, nella GeS (gestione sportiva) da così tanti italiani in posizioni così importanti e delicate. Ferrari SF70H. Voto: 10 e lode. Non è una monoposto convenzionale o un copia incolla di altre. 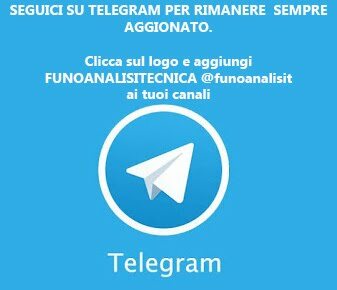 Ha anzi alcuni concetti sicuramente innovativi (vedasi pance). Viene da pensare che a Maranello abbiano saputo interpretare in modo eccellente il cambio regolamentare. E’ ancora presto per parlare di una monoposto da Mondiale. Ma è sicuramente un’ottima base. Impensabile sino a pochi mesi. Mercedes W08. Voto: 7 e mezzo. L’impressione è che la monoposto sia meno facile da regolare rispetto alla precedente, e che tenda a far scaldare troppo gli pneumatici posteriori. Gufando ti viene da sperare che sia tornata la Mercedes mangiagomme che ammiravamo (si fa per dire), qualche anno fa. Accendo un cero in Chiesa. Doppio pugno di Toto Wolff. Voto: 10. Molto cinematografico (chissà quanto vero o quanto fatto a favore delle telecamere, scusate la malizia). E’ subito diventato virale sul web con tanto di musiche ritmate e montaggi divertenti. Una goduria. Raikkonen. Voto: 6. In Australia non ha trovato il giusto feeling con la sua monoposto. Ma a Barcellona girava su ottimi tempi. Speriamo in un incidente di percorso. Comunque il 4° posto non è da buttare. Permette ai ferraristi di cominciare da leader anche nel mondiale costruttori. Mad Max. Voto: 7. Ci tenta sempre alla garibaldina, ma si vede che è più maturo. E una volta tanto, senza volerlo, ha dato una mano alla Ferrari. Contrappasso. Red Bull. Voto: che bello vederli in difficoltà. 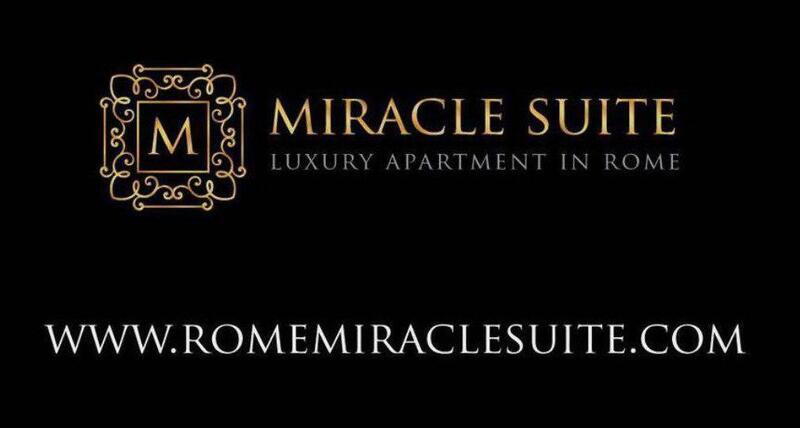 Lasciatemi passare la cattiveria e lasciatemi pure pensare che dovendo rimettere mano alla sospensione anteriore perché cassati da mamma Fia (dopo suggerimento Ferrari), di solito molto buona con i bibitari, i nostri si siano trovati in difficoltà. Non credo ci impiegheranno molto a tornare a lottare assieme a Ferrari e Mercedes, ma per ora concedetemi questa perfida soddisfazione. Mauri-Iron-Arrivabene. Voto: bravo. In molti (io stesso), avevano dato per finita la sua esperienza a capo del team di Maranello. Come gli altri ha lavorato sodo ed è stato parco di proclami. Va bene così! Nuove monoposto. Voto: 10. Finalmente si può parlare di monoposto di Formula 1. McLaren Honda. Voto: non voglio sparare sulla Croce Rossa. E’ sotto gli occhi di tutti il disastro Honda. E’ una debacle davvero senza precedenti, che forse ha la sua spiegazione nel particolare modo di lavorare dei nipponici, probabilmente non adatto ad una formula uno così complessa. Tutti pensavano a sfracelli, magari dopo un primo anno o due di apprendistato. Il precedente connubio con la Mc-Laren è stato da leggenda. Invece ora è già una vittoria se finiscono un gran premio senza ritiri. Alonso. Voto: bomba pronta ad esplodere. E’ probabilmente il pilota di Formula 1 più completo, si trova da tre anni a lottare nelle retrovie. Chi ama questo sport non può che sperare che riesca finalmente a lottare per vincere. Giovinazzi. Voto: è un talento. Magari la Ferrari per il prossimo anno potrebbe promuoverlo ed affiancarlo a Vettel. Credo che un pensierino ce lo stiano facendo in quel di Maranello. Felipe Massa. Voto: 10. E’ entrato nella storia. Il più breve ritiro della F1. Si, sono ironico ovviamente. Ecclestone. Voto: desaparecido. Pensavamo fosse eterno. E invece, taac (come direbbe Pozzetto), lo hanno esautorato e si volta pagina. Il tempo, piaccia o no, passa per tutti. Ai posteri l’ardua sentenza su come abbia trasformato la F1. Direzione di gara. Voto: 7. Credo tutti abbiano notato come i piloti siano stati abbastanza liberi di lottare fra di loro e come la Safety-Car non sia intervenuta. L’anno scorso sarebbe intervenuta almeno due volte. Un buon segnale. Speriamo bene per i prossimi gran premi. Spettacolo. Voto: 5. Su F1AT avevamo ipotizzato che difficilmente le nuove norme avrebbero favorito i sorpassi. E ci abbiamo preso. Così siamo passati da sorpassi a go go, artificiosi, a mancanza quasi totale di sorpassi. Certo, troppo presto per vedere se questo sarà il trend di tutta la stagione. Comunque se devo scegliere fra pochi sorpassi studiati e memorabili, compresi quelli tramite pit-stop, piuttosto che decine di sorpassi causa gomme che degradano e DRS, preferisco la prima opzione. Se ci pensate bene negli ultimi 30 anni abbiamo avuto battaglie memorabili ma di certo non tantissimi sorpassi. Gommoni Pirelli. Voto: 8. Da quando c’è l’ibrido, e anche negli anni del regime monogomma, non è che la Pirelli abbia proprio brillato. Tutt’altro. Con il dubbio che resterà sempre agli appassionati di qualche mondiale falsato proprio a causa delle gomme. Ma a quanto pare, quest’anno hanno realizzato pneumatici che hanno una finestra di utilizzo maggiore e soprattutto sono costanti nel loro rendimento. Lo chiedevano a gran voce i piloti. Credo siano stati accontentati. E meno male. Una rondine non fa primavera. Ma fa ben sperare. Giuro: se tutte le levatacce per vedere un gran premio di F1 avessero il dolce, corroborante, splendido finale di domenica 26, ne farei volentieri altre 19 in un anno! Tuttavia, devo ricordare a me stesso e a chi segue la Formula Uno, in particolare i ferraristi (famiglia cui appartengo), un pochino di sano pragmatismo (viste le tante delusioni collezionate in questi ultimi dieci anni). Tocco ferro anche io sia chiaro e non voglio certo fare il menagramo. Tutt'altro. Tra l’altro, anche se non fossi di fede “maranelliana”, saprei bene che una Ferrari che lotta sempre al vertice e che magari vince il mondiale fa bene a tutto l’ambiente degli sport motoristici. L’adagio dice: “Una rondine non fa primavera”. Parafrasando: una vittoria non fa il mondiale. Ma, aggiungo, fa ben sperare. Il sunto è: godiamoci questa vittoria. Archiviamo questa prima casella di 20, pensando a ciò che è stata: una vittoria ottenuta con autorevolezza. Niente fortuna. Come ha twittato a caldo FUNOAT, questa è forse la vera prima sconfitta della Mercedes nell'era dell’ibrido. 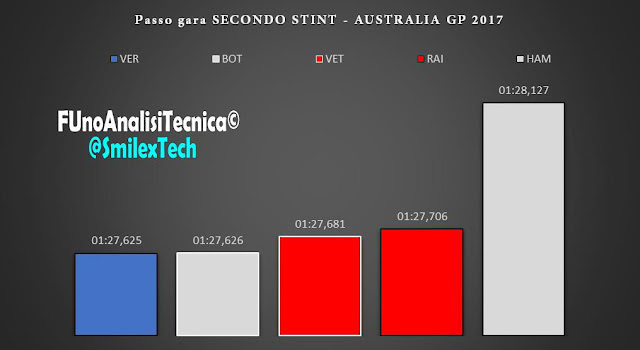 L’analisi dei passi gara, sin dalle simulazioni di venerdì, mostrava che la Ferrari aveva un buon passo anche se, la Mercedes, sembrava essere superiore. L'incognita carburante e il lavoro sul setup fatto dagli ingegneri di Maranello hanno permesso a Vettel di arrivare alle qualifiche e alla gara con una vettura molto bilanciata. Non si sa se senza Verstappen davanti a Hamilton, Vettel sarebbe riuscito a passare la Mercedes al pit-stop, ma si sa che una volta davanti ha rifilato, con una costanza invidiabile, secondi su secondi all'astronave anglo-tedesca. Addirittura ben 10 secondi. Impensabile sino a pochi mesi fa. Cosa sappiamo? Almeno due cose: la Ferrari ha lavorato in silenzio, subendo lo scetticismo di molti (io, fra gli altri), e costruendo una monoposto che con le nuove regole funziona. Ma la Ferrari ha lavorato anche politicamente. Il sottoscritto (permettetemi per una volta di essere immodesto), assieme a pochi altri lo aveva notato sin dagli ultimi gran premi della disgraziata stagione 2016. Mi riferisco soprattutto alla spinosa questione delle sospensioni delle monoposto e del loro uso in funzioni specificamente aerodinamiche. Sia chiaro: non si intende, per lavorare politicamente, fare regole che ti avvantaggino. Ma, perlomeno, essere tutti alla pari, senza “furbate” tecniche. 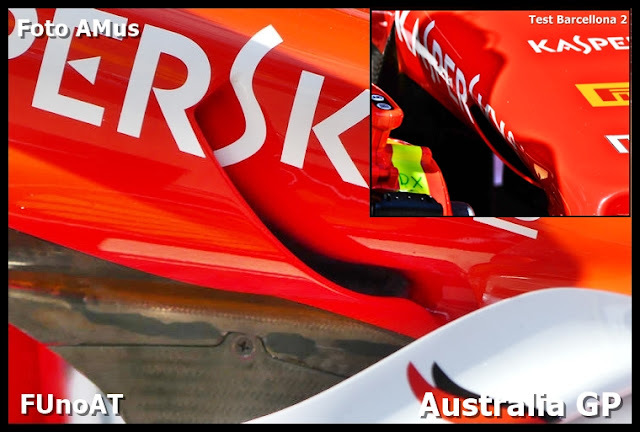 Cosa sperare, dunque, mentre la mente assapora le immagini del circuito di Melbourne invaso da tifosi della Rossa? Che la Ferrari sappia sviluppare nel corso della stagione la sua monoposto. Questa è la vera sfida! Gli altri non staranno a guardare. Ne Mercedes ne, tanto meno Red Bull.